The SharkBite Flexible Coupling Hoses are used in residential and commercial applications to easily connect CTS pipe in any combination. The connectors are EPDM knitted with braided stainless steel. 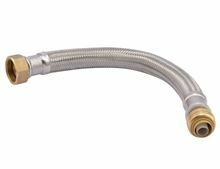 The SharkBite connection allows the installer to connect to Copper, PEX, CPVC and PE-RT tubing and eliminates the need for an additional transition fitting. Shark Bite Fittings are made of DZR (dezincification resistant) brass which provides a strong, durable fitting that is corrosion resistant. The SharkBite is designed and certified to ANSI/NSF-61 and ASSE 1061 product standard for use in potable water and hydronic heating water distribution.